Barbara Briggs Biography - custom, unique, one-of-a-kind silver jewelry. "Adornment, be it jewelry or clothing, has always fascinated me. As a child I spent many hours creating wearable treasures made of all manner of found objects - twigs, shells, beads, buttons, cast-off costume jewelry parts, and more comprised my collection. I also loved playing "dress-up" and still do! I poured over the fashion pages of magazines such as Vogue and Bazaar. They became my favorite bedtime stories! In my day-dreams I was a princess dressed in royal jewels, gowns of silk and other finery. As an adult I am still enamored with jewelry and other wearables. It is the process of making these adornments that I find so exciting and being able to wear the end results. Creating jewelry and knitting wearable art has allowed me to experiment with color, texture, and form to my heart's content!" 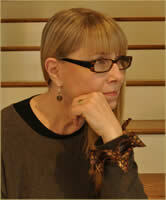 Studied jewelry making at DeCordova Museum of Art in Lincoln, MA and at College of DuPage in Glen Ellyn, IL. Self-taught in fiber arts, silk painting, and free-form basketry. Owned and operated Fibre Ltd., a knitting and weaving studio in Cedarburg, WI 1978-1986. Taught beginning jewelry classes at DeCordova Museum of Art in Lincoln, MA 1990-1992, Shibori silk dyeing and free-form basketry at the Milwaukee Art Museum, Milwaukee, WI 1999, and sculptural basketry at the Charles A. Wustum Museum of Fine Art, Racine, WI in 2001. Received PMC (Precious Metal Clay®) Certification in 2005. Presently working in precious metal, polymer clay, beaded jewelry, and loom knit wearables, Barbara Briggs specializes in one-of-a-kind and limited edition pieces. Galena Gazette - December 26, 2007 article "Letting Creativity Reign"